With the aim of extending the empire of the Catholic Religion and the power of the Holy See in the East, Pope St. Gregory VII had already exhorted the faithful to take up arms against the Muslims, he himself promising to lead them to Asia. In his letters St. Gregory VII spoke how the sufferings of the Catholics in the East had touched him to the point that he desired death. He said he would like to risk his own life in order to free the Holy Places. St. Gregory VII, however, was not able to realize his plan due to internal problems in Europe. 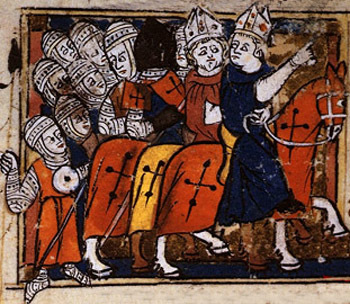 Moved by the same spirit as his predecessor, Blessed Urban II resolved to convoke the Council of Clermont in November of 1095 in southern France, the heart of the warrior nation which for many centuries had set the tonus for Europe. Responding to the call were more than 200 Archbishops and Bishops, 4,000 ecclesiastics and 30,000 laymen. The most famous Saints and Doctors honored it with their presence and illuminated it with their counsels. The Council passed numerous decrees for ecclesiastical discipline and the reform of the Church, including ones concerning simony and clerical marriage. But all these decrees – even the excommunication of Philip I, the King of France, for adultery - did not manage to deviate the general attention from the point that was considered the most important, which was the captivity of Jerusalem and the abuses taking place there. 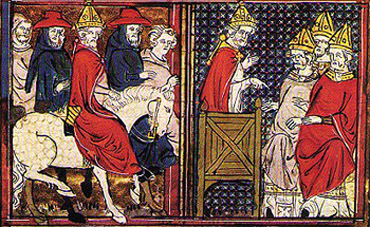 On the day of Pope Urban’s speech, the Council convened in the large square outside the eastern gate of Clermont where the papal throne was set up in order to accommodate the immense crowd. The Pope, followed by his Cardinals, processed in and the meeting began. "We have heard the message of the Christians of the East. It described to you the lamentable situation of Jerusalem and the people of God. It described how the city of the King of Kings, which transmitted the pure Faith to all the other cities, was obliged to pay service to pagan superstitions. And how the miraculous Sepulcher where death could not guard its Prisoner, the Sepulcher which is the source of future life and, above all, where the Sun of the Resurrection rose, was befouled by those who will not rise again except to serve as straw for the eternal fire. "A victorious impiety has suffused the most fertile lands of Asia in darkness. The cities of Antioch, Ephesus and Nicaea already are taken by the Musselmen. The barbarous hordes of Turks pitch their standards at the very borders of Hellespoint [where the Aegean Sea meets the Sea of Marmara], where they threaten all the Christian nations. If the one true God does not contain their triumphant march, arming their children, what nation, what kingdom will be able to close the doors of the West to them? The Pontiff continued: “Warriors who hear my voice, you who will go to war, rejoice, because you are taking up a legitimate war … Arm yourselves with the sword of the Maccabees and go to defend the house of Israel who is the daughter of the Lord of Armies. “It is no longer a matter of avenging just the injuries made to men, but rather those made to God. It is no longer a matter of attacking a city or a castle, but of conquering the Holy Places. If you triumph, the blessings of Heaven and the kingdoms of Asia will be your reward. If you succumb, you will achieve the glory of dying in the same Land where Jesus Christ died, and God will not forget that He saw you in the Holy Militia. This speech of Urban II touched the hearts of all. It seemed as if an ardent flame had descended from Heaven. The Bishop of Puy, reputed for his knowledge and firmness, was the first to enter onto the pathway of God, taking the Cross from the hands of the Pope. Many others followed his example. The Pope promised the crusaders absolution for their sins. And he placed their persons, families and goods under the protection of the Church and of the Apostles St. Peter and St. Paul. The Council declared that anyone who made violence against the soldiers of Christ would be punished with the anathema. The Holy Father regulated the discipline and fixed the departure date for those who had enlisted in the Holy Militia. 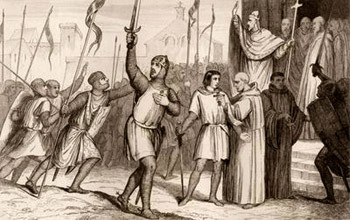 Fearful that some might remain in their cities because of self interest, he threatened those who failed to carry out their oaths with excommunication. Urban II traveled through various provinces of France to complete his work, convoking other councils. This boundless enthusiasm followed him and communicated itself to the rest of the French people, and then spread to England, Germany, Italy and even Spain, which was combating the Saracens on its own territory. Religion was the only goal of the war against the infidels. Love of parents, the bonds of family and even the most tender affections were sacrificed for the ideals that overtook all Europe. Moderation was cowardice, indifference was betrayal, and opposition, an outrage and sacrilege. Numerous miracles helped to raise the enthusiasm of the multitudes. Stars detached themselves from heaven and fell to earth; unknown fires struck in the air; clouds took the color of blood, and a threatening comet appeared in midday in the form of a sword. 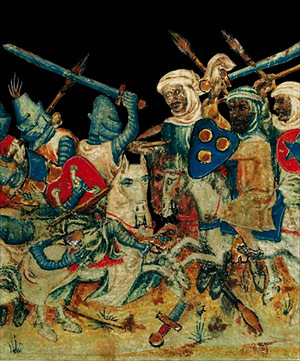 Many of the French saw Charlemagne exhorting the Christians to combat the infidels. The priest of each parish blessed the arms that were piled up before him. He begged the All-Powerful Lord to grant to those who would bear them the valor and strength that led David to defeat the unfaithful Goliath. After sprinkling the standards of the Cross with holy water, he delivered them over, saying, “Go to combat for the glory of God and let this sign make you triumph in all dangers.” The crusaders received their symbols on their knees.